Because so many folks still have interest in this web site, the original home page has been restored (slightly modified). Revised the Pedigrees below with added dates. To the descendants Susan Martha (Pope) Smith and her brother, Theodore Pope: You and your families are all invited to participate in the Smith-Pope Family Reunion to be held on May 27th, 2006 . We have reserved the fellowship hall of the First Southern Baptist Church, at 715 N. Woodlawn, Wellington, KS. There is a game room and gym with a playground across the street Since we do not know all your families addresses, we encourage you to get in touch with each and every one of them , as we want all who can, to come. The attached map is of the city of Wellington. If you come in on Highway 160 , the church is only about 2 blocks south on North Woodlawn on the east side of town. Please bring a meat dish and 1 other dish (salad, veggie, or dessert) plus your own service. Drinks will be furnished. Hope to see you there! Click here for a MAP of the church location. Some of the history of the Thomas J. Pope family has been compiled by E. Jerome Niebaum. of the Descendants of Joseph Grant Smith by Judy Knoblock. The following stories are based on oral history. In the late 1880s the Joseph Grant Smiths moved to near Trinidad, Colorado where Joseph was a cowboy. The family lived in a tent at that time. Elsie Smith's birthplace is believed to be Trinidad, Colorado in 1889. Joseph Smith, made the 'run' into the Cherokee Strip when it opened for homesteading in 1893. Joseph was about age 30 and staked a claim160 acres. He returned to Kansas for his family and someone removed his markers, claiming the land for their own. Joseph went to court to prove rightful ownership, and lost. He always believed that his lawyer had been paid off by the other parties, and never trusted a lawyer thereafter. Some of the Smith children were born on the Smith farm on the Canadian River near Minco in Oklahoma Indian Territory. Oklahoma didn't become a state until 1907. 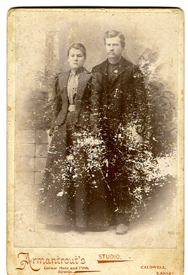 About 1915 the family moved to southern Kansas in a covered wagon, probably pulled by oxen. They camped one night at the Salt Fork River and used the salty water to make coffee for dinner in the evening. Grace Smith Niebaum recalled that her mother tied a kewpie doll to a string and hung it from the top of the wagon for her to play with on the trip. She remembered that experience all her life. At the time that Joann Niebaum was born, Grace and Herman Niebaum were living with Susan Martha and Joseph Grant Smith. Though tractors were in use then, the Smiths farmed with a team of horses. Herman always referred to his father-in-law as 'Dad Smith'. He said that Dad Smith couldn't drive his team straight to save his soul. Dad recalled that one day after planting all day with the team he asked, "Dad Smith, how are you ever going to cultivate those crooked rows?" Without missing a beat Joseph replied, "Why, I'll just use the same horses!" Herman loved sharing that story, and he always laughed the most in its telling. Mother's Day, May 12, 1935, the Smith family was preparing for a picnic on the Chikaskia River between Corbin and Caldwell. Herman Niebaum & his brother-in-law, Horatio ["Shoate"] Hardin with Joseph Smith as driver were driving to the picnic site to fish before the picnic began. About two miles north of Corbin, KS a fast-moving car hit them broadside on Joseph's side, throwing him from the car. He died enroute to the hospital. Herman and Horatio were not seriously injured. Grandmother Smith was unable to continue with the farm, and gave it up to her youngest daughter, Finace, and husband, Ralph Watts. From then on Grandma Smith stayed for a few months at a time with each of her children for most of the rest of her life until her death in 1956 at age 89. At the time of her unexpected death she was planning to remarry a friend from her youth. One of life's great regrets is missed opportunity to review the history of one's ancestors with those who are best able to relate it. That wisdom comes only with age and by then, the chance has passed. As a child I spent many hours with my Grandmother Smith, but never asked the many questions I now have. How I would love to question my grandfathers about their 'run' into the Strip in 1893. Or, to hear Granddad Smith tell of his time as a cowboy in Colorado when his family lived in the tent near Trinidad. Or, once again hear Grandmother Smith tell about walking to school clacking two bones together to scare away the wolves and coyotes."